Mazda is a Japanese car manufacturer founded in 1920. The company has collaborated heavily with Ford to bring cars to the US market and still enjoys a strong relationship with the US brand. Mazda's "Zoom-Zoom" marketing campaign is among the longest-lived and most successful in automobile marketing history. 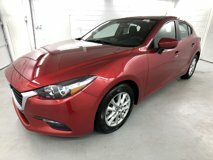 CarSense offers the best used Mazdas at no haggle prices in the Pittsburgh, Philadelphia and South Jersey regions. But don't compare price alone. How do you put a price on our Lifetime Engine Guarantee and Home Delivery?